31 Mar. 31 July. 30 Nov. 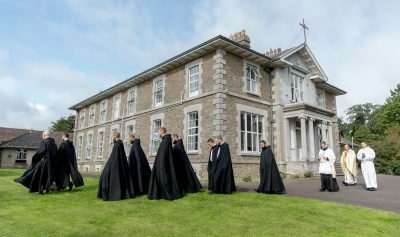 Although the life of a monk ought at all times to have about it a Lenten character, yet since few have strength enough for this, we exhort all, at least during the days of Lent, to keep themselves in all purity of life, and to wash away, during that holy season, the negligences of other times. This we shall worthily do, if we refrain from all sin, and give ourselves to prayer with tears, to holy reading, compunction of heart and abstinence. 1 Licet omni tempore vita monachi quadragesimae debet observationem habere, 2 tamen, quia paucorum est ista virtus, ideo suademus istis diebus quadragesimae omni puritate vitam suam custodire omnes pariter, 3 et neglegentias aliorum temporum his diebus sanctis diluere. It is remarkable that we read this Chapter XLIX, “On the Observance of Lent”, every year on the feast of Saint Andrew, the Apostle of the Cross, and at the beginning of Advent. Saint Benedict says that our life ought at all times to have about it a quadragesimal observance or, as it is usually translated, a Lenten character. We need to understand what our Patriarch means by “a Lenten character”. With his characteristically humble realism, Saint Benedict adds that few “have the strength for this”. This is always the Benedictine premise: a lack of virtus, of strength. We find this premise throughout the Holy Rule expressed in different ways. Saint Benedict often speaks of infirmitas of mind and body; this refers to a lack of firmitas, that is firmness, steadfastness, stability, endurance, constancy, power. Infirmitas is want of strength; weakness, feebleness; it is also want of spirit, want of courage, fickleness, and inconstancy. Saint Benedict also speaks of imbecillitas, imbecility. The word has acquired a pejorative connotation in colloquial English, but it means weakness or feebleness of mind or body, especially in reference to small children or the very old. Some argue that the word derives from the Latin for “without a walking stick or support”, that is a baculus. In Chapter XXVII, Saint Benedict also speaks to us of wobbly or wavering brethren: fratres fluctuantes. We must have patience with the depth of vice that is in us, and make it the subject of our humiliation, but we must, in no way, follow the disordered movements that it produces. It is this that would be sin, and not the awareness of the depth of wickedness that is in us. One must bear with this without being perturbed [by it] because it serves as a throne for Jesus Christ, and He delights in a soul that accepts and feels its own corruption in this way. At bottom, I still have a distance [from everything] and I find only God alone as my one support. In Him I find the only thing I need. It seems to me also that I have absolutely no ambition to build a showcase monastery; on the contrary, I would want a very little place, a place in which one is not seen nor known by anyone. There are enough brilliant houses in Paris in which God is honoured in magnificence; I desire that this house should honour Him in silence and in nothingness, without, however, diminishing anything of what might contribute to the worship and honour of the Blessed Sacrament, that is, for the church and the altar of the Lord. Silverstream is far from being what Mother Mectilde calls “a showcase monastery”. The beginning of Advent, however, is an opportunity offered us by the liturgical providence of God, to enter into the “silence and nothingness” in which it pleases God both to speak and to act. Who among us is bold enough to pray, “Silence me utterly, O God, and bring me to nothing, lest the noise of my thoughts, the disturbance of my words, and the hubris of my actions, impede the action of Thy grace in me”? This may well be the grace of Advent for us: a deeper participation in the silence and humility of the Immaculate Virgin Mary, an entrance into the silence and humility that, in all seasons, constitutes the Lenten character of our Benedictine life.